Read your battery bank like a fuel gauge. LinkLITE supplies battery status at a glance, with all the basic information you need. The large backlit LCD display and intuitive user interface shows accurate status of your single or two-bank battery system (digital resolution to 0.1). Includes a low battery alarm with a trigger to control external equipment. Easy to use and install. Includes the key features of the LinkPRO in a simpler and affordable package with lower monitoring limits, and without networking communication or battery temperature sensing. 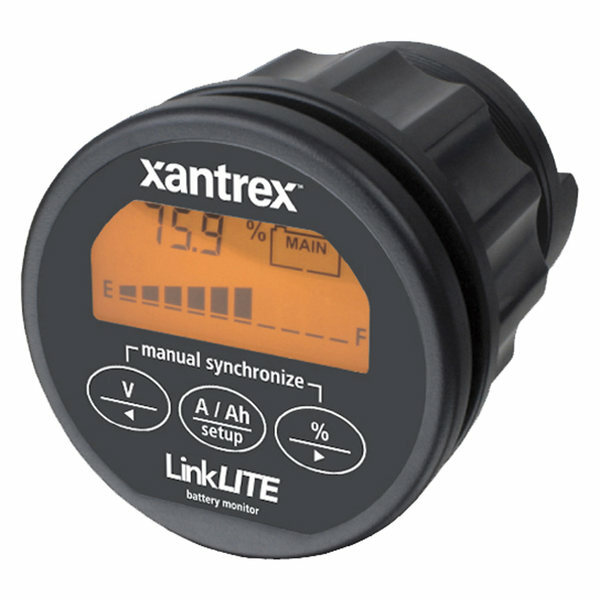 The LinkLITE battery monitor can measure currents up to 1,000Amps. It selectively displays voltage, charge and discharge current, consumed amp hours and remaining battery capacity. It is equipped with an internal programmable alarm relay, to run a generator when needed or to turn off devices when the battery voltage exceeds programmable boundaries. The LinkLITE selectively displays voltage, charge and discharge current, consumed amp hours and remaining battery capacity. Using a clear backlit LCD Display and an intuitive user interface, all parameters can be recalled with just a button press. A second battery input is also provided to monitor voltage on a second battery. It is equipped with an internal programmable alarm relay, to run a generator when needed or to turn off devices when the battery voltage exceeds programmable boundaries. WARNING: This product can expose you to chemicals including Diisononyl Phthalate (DINP) which is known to the State of California to cause cancer and Di-isodecyl Phthalate (DIDP) which is known to the State of California to cause birth defects or other reproductive harm. For more information go to www.P65Warnings.ca.gov.